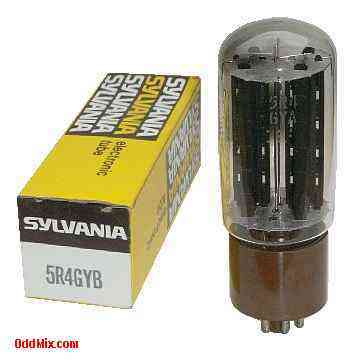 This is a genuine, vintage, Sylvania 5R4GYA electronic tube. Used for medium-voltage low-current full-wave rectifier applications, in radio receivers or RF equipments. At one time these tubes were used in many special circuits, receivers, transmitters and transcievers. This medium HV (High Voltage) Full-Wave vacuum rectifier tube is excellent for antique radio and television TV restoration projects or to set up a private vacuum tube museum. This tube is no longer Available.